The polyphonic, melodic and rhythmic characteristics of guitar supply a never-ending source of inspiration, creativity, and invention. Triggering the creative process, however, is not easy — we've all experienced the guitarist's equivalent of "writer's block" in all aspects of our playing. If your creative juices have been a little drippy lately, rejoice because your fix is in hand. Fingerscapes' rut-busting, invigorating curriculum will cure all that ails your originality. 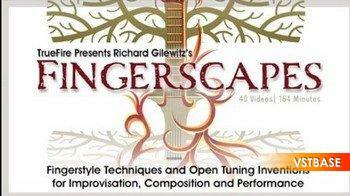 Fingerscapes is a cerebral course of study for guitarists across all styles. For the left brain; a palette of tools and techniques for rousing creativity. For the right brain; an "imaginarium" to stimulate invention. Fingerscapes is also chock-full of paradoxes. You'll learn fingerstyle moves, but this is not necessarily a fingerstyle course — flatpickers are more than welcome. You'll work with open tunings, but this is not an open tuning course. You'll learn how to compose original tunes, but no harmony and theory here. The entire curriculum is presented on acoustic guitar, but feel free to plug in the electric, pump up the volume and wail away. Your Fingerscapes tour guide, Richard Gilewitz is widely respected as one of the most graceful fingerstyle guitarists on the contemporary scene. Gilewitz has collaborated and appeared in concert with the likes of John Renbourn, Mose Allison, John Fahey, Leo Kottke, Adrian Legg, The Little River Band, Taj Mahal, John Hammond, Rory Block and Jorma Kaukonen. Richard is also an excellent instructor with an innovative approach for communicating and demonstrating conceptual approaches for guitar-centric composition, improvisation, and performance. During your Fingerscapes adventures, you'll play your way through a variety of motifs and "grooves" to learn how to develop your own twists, turns, and original inventions. You'll improve your creations in multiple tunings, spanning open G, C, and D — as well as Drop D and standard. You'll discover how to push yourself out of the comfort zone and propel yourself to the creative zone. You'll learn how to texturize and colorize your compositions and improvisations using techniques such as note accenting (for vivid 3-D effects), right-hand arpeggiated patterns, finger pairings, pinch patterns, hammer-ons, rolls, pull-offs and alternating bass styles. You'll even learn a little slide to spice up your Fingerscapes.